“Bo Bun” : what is it ? Regarding the quantity, it really depends on you and your taste. Start by peeling the shrimps and cook them in the pan with some butter et the parsley until they get grilled. Mix regularly so the shrimps absorb the butter and parsley flavor. Then, peel the carrot and make small strips with the peeler until there is no more carrot, and put strips in the frying pan with the shrimps, and add of the ginger and the paprika at your convenience. Stop the cooking when the strips become tender. Then, take the lemon, remove the supremes and cut it into small cubes ; add it to the shrimps and carrot strips. Once the noodles are cooked as per your taste, put them into a big salad bowl. 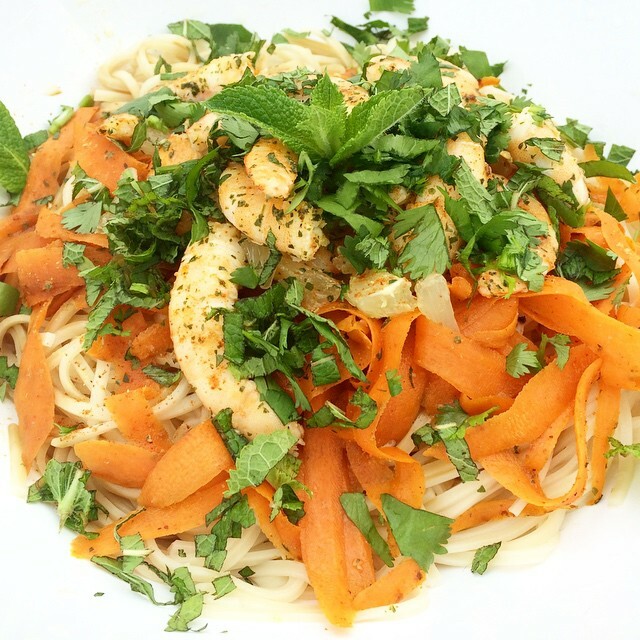 Dispose on the top the carrot stripes, the shrimps with lemon, pour a bit of soy sauce, then add the mint and coriander. Add some salt and pepper and that’s it.